The Southwest Ohio Association of School Nurses is very pleased and honored to host again for the 46th Annual State Conference of the Ohio Association of School Nurses (OASN). This year promises great speakers, exhibitors, and lots of fun as we offer once again, the “Balloon Drop” fundraiser as well as the “Magical Endowment Raffle”. Whether you are new to school nursing, a seasoned school nurse or enjoying retirement, we will have great information for you that will be inspirational and educational. Saturday Keynote Speaker, Janice Selekman, DNSc, RN, NCSN, FNASN is the well-known author of School Nursing: A Comprehensive Text. Dr. Selekman’s professional experience includes serving as professor and chairperson at the University of Delaware’s Department of Nursing. Janice received her DNSc from the University of Pennsylvania’s School of Nursing and majored in Nursing Research with research focus on body image in children. Numerous awards include 2015 NASN’s Distinguished Service Award, Barbara A. Larsen Humanitarian Award, 2013 and the 2012 AJN Book of the Year Award for School Nursing: A Comprehensive Text. Dr. Selekman has presented at numerous NASN conferences and we are honored to have her as our keynote speaker in 2019. Saturday’s presentation, What is Happening to the Mental Health of Children? focuses on how mental health has become a major issue in pediatrics. ADHD, learning disabilities, autism, self-injury, addiction, depression and suicide are but a few conditions, yet there is a dearth of resources for these students. This presentation will discuss the changing scene in mental health, including changes in the approaches to diagnoses and treatment and the school nurse’s role. Sunday Keynote Speaker, Janice Selekman, DNSc, RN, NCSN, FNASN co-authored the text titled School Nurse Certification Review. This was the first National Certification for School Nurses review book ever published to help the school nurse study and prepare for the NCSN exam. Dr. Selekman will complete the second half of the National School Nurse Certification exam review (first half offered in the 2018 OASN conference.) Her presentation will complete the information needed to prepare for the School Nurse Certification Examination. Topics include screenings; growth and development, including family and culture; prevention, including immunizations; AEDs and epinephrine auto-injectors; and dermatologic, musculo-skeletal, neurologic, hematologic, and respiratory conditions. Friday’s Keynote Speaker Annie Stephens, Ohio School Outreach Coordinator from Sandy Hook Promise (SHP) will share information on this nonprofit organization led by several family members who lost loved ones at the Sandy Hook Elementary School shooting on December 14, 2012. Balloon Drop (During Saturday business meeting).Who says business meetings can’t be fun?Participants could win a $100 grand prize and everyone participating wins something. All proceeds support the OASN organization in its mission to provide school nurse education and research. This reception time will be both exciting and fun!A very special group of committee members is working hard to plan a special night for all from 5:30-7pm which leaves you lots of time to still go out for a fun evening to explore SW Ohio. Reception food is included with your registration fee, so please plan to attend and connect with old friends (and make new ones! )A cash bar will be available. Saturday evening Endowment Event: The Endowment Committee invites you to join us and take “A Flight Back in Time” on March 9th from 6:30 P.M.-9:30 P.M at the Carillon Brewing Company’s, Bier Hall, located in Dayton’s Historical Carillon Park. Reservations are required.Cost is $45 with $20 going directly to the Endowment Fund in your name. Challenge to you this year- sign up if you have never experienced being part of the OASN Education and Research Endowment Fund. It feels great to give back and support your profession.Make history by making this the year that you begin a new tradition by attending this fun event. We hope you plan to join and participate in each of the fun-packed events listed above! Make this the year that you get involved in every activity planned just for you! Win a free trip to the 2019 NASN Conference in Colorado. Wow! The drawing will be held after the final presentation on Sunday. Newly renovated premium hotel guest rooms with the Wright Brothers “Flight Theme” throughout this gorgeous hotel. Not only are the hotel guest rooms newly renovated, the entire hotel lobby, ballrooms and dining/bar area have been as well. When registering for hotel lodging be sure to request the OASN Conference Room Rate of $112.00 per night plus taxes. Maximum room occupancy is four (4). Click Here to go to the Marriott Hotel site for room reservation. VERY IMPORTANT!!! Please do not register through an outside party like Expedia. OASN gets special monetary incentives which helps lower conference costs if everyone registers only through the Marriott and by mentioning the “OASN Conference” when registering. Thank you for your support. This year a free breakfast will be included for all conference attendees that register for the conference on Friday and Saturday. Friday and Saturday includes a full breakfast with a continental breakfast for the ½ day on Sunday. Don’t forget that the Friday night Celebration Reception dinner is included in your registration. EARLY BIRD CONFERENCE REGISTRATION EXTENDED TO FEBRUARY 9, 2019 DUE TO POLAR VORTEX! Take advantage of Early Bird Rates plus those who have a paid registration before February 15, 2019 will be entered in a drawing for a $50 Amazon Gift card. The drawing will be held at the end of the OASN Business Meeting. Don’t miss this once-a-year opportunity for great networking, professional growth and fun! Can’t wait to see you in March!! 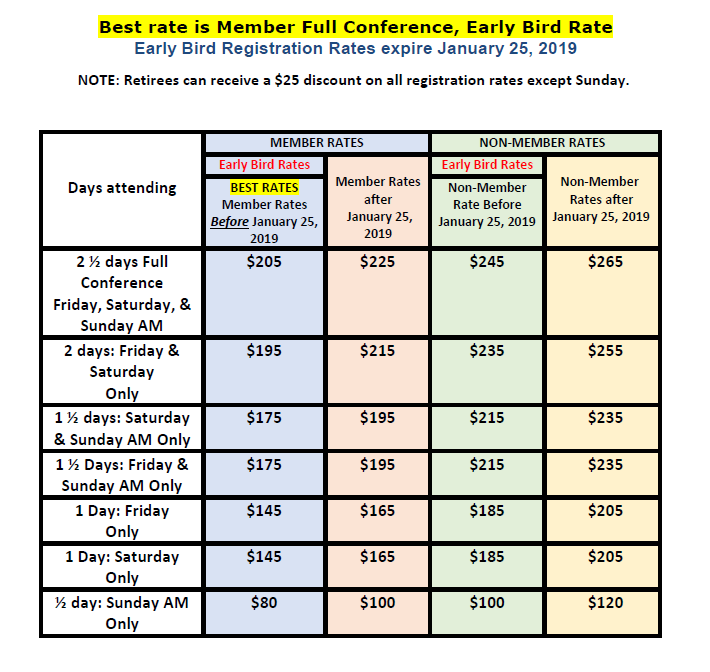 Early Bird Conference Registration Rates Have Been Extended to February 9, 2019 DUE TO POLAR VORTEX! An evaluation form must be completed and turned in for each session or day of the conference that was attended. Exhibitors, Vendors, Sponsors and Advertisers. Exhibitors Hall is available on Friday and/or Saturday. We hope you will consider joining us at this event!